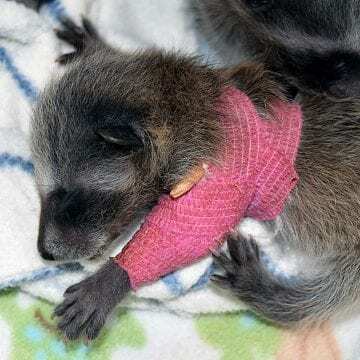 The BC SPCA’s Wild Animal rehabilitation Centre (Wild ARC), in Metchosin on southern Vancouver Island, treats almost 3,000 injured and orphaned wild animals each year. Whether an eagle or deer, raccoon or river otter, Wild ARC’s staff and volunteers work tirelessly to treat and rehabilitate each patient for their eventual release back into the wild. Here’s a glimpse into a typical day at the facility, which sees more than 140 different species through its doors annually. 7 a.m. – For the BC SPCA’s Wild ARC rehabilitators, the day starts with a quick review of notes from the night before, and a peek at critical patients to check how they fared through the night. Hopefully the morning jolt of caffeine was absorbed on the drive in to work, because there’s no room for a slow start here! Formula must be measured and heated for the first of many baby mammal feedings, and fragile young songbirds who need their first syringe-feed of the day (a process that will continue as often as every 15 minutes through the day). The first load of laundry is started, and that washing machine won’t rest until the centre closes for the night. 8 a.m. – The morning volunteer crew arrives, and jumps into action to help the many birds and mammals in their care. Wildlife chefs keep fresh diet ingredients at the ready, while animal care volunteers scrub kennels and hose down enclosures in between bottle-feeding baby raccoons and hand-feeding fledgling Cedar Waxwings and American Robins. The phone rings with the first wildlife rescue call of the day, just as several wild patients arrive from a local vet clinic that serves as an overnight transfer point. 9 a.m. – With the morning well underway, each adult wild patient – from a Pileated Woodpecker with head trauma from hitting a window to a juvenile bald eagle healing from a talon injury – needs food, medication, and a clean enclosure. Wildlife assistants head out on their first greenery run of the day – two daily excursions are needed to provide enough nutritious leafy snacks for the growing deer fawns. Energetic Wild ARC Outreach Team volunteers depart for a local market event to educate and engage with community members. Since more than 80 per cent of the wild animals treated at Wild ARC are impacted by human activity, a large part of its mission is to educate the public about wildlife, animal welfare and co-existing with nature. 11 a.m. – As the second shift of rehabilitators arrives, staff begin to tackle the day’s projects, which include assessing a flock of Dark-eyed Juncos ready for release, transferring a Merlin with a soft-tissue wing injury to a larger outdoor enclosure, and changing the bandaging on a young mink recovering from puncture wounds from a raptor attack. Noon – The second shift of volunteers clock in, and the focus changes from the rush of diet preparation and morning rounds to more extensive enclosure cleaning. They add enrichment for various patients, including fresh pools with seaweed and oyster shells for curious young raccoons, and blackberry vines with plenty of juicy berries for a group of Northwestern Crows nearly ready to return to the wild. Meanwhile, in the administration office, Wild ARC’s manager Kari Marks connects with a generous supporter offering an art piece for the upcoming Fall for Wildlife Dinner Auction. 2 p.m. – It’s now time to perform more complex treatments, like delicate surgery on a small White-Crowned Sparrow who was caught by an outdoor cat. A wildlife assistant heads into town to pick up donated produce from a local grocery store and extra supplies while a Wildlife Transport Team volunteer arrives with a Varied Thrush who has been hit by a car. 4 p.m. – As the final volunteer shift of the day arrives, the second round of enclosure cleaning and diet preparation begins. Diet preparation alone is a massive undertaking – an extremely detailed Wild ARC recipe book has specific recipes for animals in more than 45 categories, with up to three different ages and three different dishes per category. 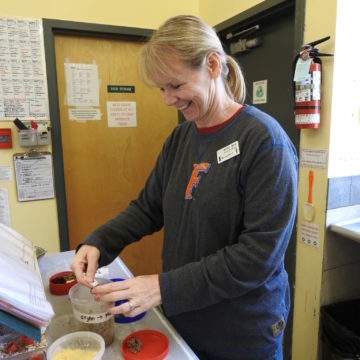 With more than $25,000 spent each year on food such as vegetables, meal worm, fish, eggs and small mammal formula, Wild ARC provides hundreds of pounds of food for wild animals. A recently admitted baby Wood Duck takes a turn for the worse, and is quickly placed on oxygen and tucked into the supportive warmth of an incubator to help alleviate her respiratory distress. 5 p.m. – There’s finally time to review the progress of all the baby birds and mammals who have been weighed earlier in the day – this is often upwards of 40 patients in the indoor wards. Rehabilitators adjust diet amounts and feeding frequencies so that each animal receives what they need to grow strong and healthy. 7 p.m. – The evening routine is well underway, but an unexpected patient arrives requiring emergency intervention from the team. A feisty adult raccoon has become tangled in netting – while courageous members of the public cut him free and contained him in a kennel, the netting is now constricting his neck and paw, and must be quickly and carefully removed. 8 p.m. – Volunteers wrap up their daily tasks, checking that each patient under their care has what they need for the night, and providing the final feedings to baby songbirds as dusk falls. Rehabilitators administer evening medications, and warm up fluids to provide extra hydration for critical patients. 10 p.m. – The final dishes are washed and set to dry, the floors are mopped, and the last load of laundry is put on for the night. A soft glow comes from the examination room, where a rehabilitator writes an update for the morning staff on new patients, critical cases, and morning priorities. It’s been another wild, crazy, and wonderful day at Wild ARC, with the diverse team of staff, volunteers, and community supporters coming together to ensure that these amazing creatures get a second chance at a wild life.